Rogue River, OR (August 28, 2015) – Wagner Meters is proud to offer the recently updated online course, “Moisture Testing of Concrete Floor Slabs.” This training webinar is specially designed for contractors and flooring installers and is presented by Howard Kanare, a leading expert in concrete moisture issues. Kanare, a former Senior Principal Scientist for the CTLGroup (a wholly-owned subsidiary of the Portland Cement Association), has spent years researching concrete slab moisture and related floor covering failures. In the webinar, he shares breakthrough scientific data that seriously challenges what we have believed regarding traditional methods for moisture testing of concrete slabs. Indeed, the information included in this free webinar is already changing the way we look at moisture testing of concrete slabs. This is essential information that every contractor and flooring installer who works with concrete will want to have at his or her fingertips. In addition to providing the most up-to-date information on accurate moisture testing of concrete slabs, this one-hour webinar includes a live question-and-answer session. Each course participant can direct questions to a representative from Wagner Meters, the world leader in concrete moisture measurement. 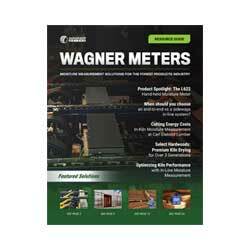 For more information, call Wagner Meters toll-free at 1-800-634-9961.